I finally got into my studio yesterday to make something real. This is what I ended up with a few hours later. I haven't come up with a name for it yet. Thoughts or suggestions? I usually end up titling my work "Untitled". Original, right? So here are the materials that I used: ribbon (two widths), handmade market papers, glass beads, freshwater pearls, metal findings and metal chain. It is displayed on a linen jewelry mannequin. I was going for something in a monochromatic color family but I wanted splashes of metallic in there. This is a purely decorative, sculptural piece and is not meant to be worn. (Todd was pretty baffled by that point.) I was going to add some paper leaves but I think that would clutter it up too much. I think maybe my next necklace may be all leaves. I also wanted it to be way bigger but since this was my first attempt, I thought I would start smaller. How gorgeous! I'm so glad that I found your blog through Linky followers blog hop! I am now a follower! Would love if you followed me back at www.lakemurraycottage.blogspot.com. Beautiful Lindsey, you are so talented! Hope you pop by my piece of blogland today and take part in a giveaway and photography class. Thanks for visiting! I will stop by your blog later! How about Sweet Temptation? Love it! Teaming together for blog performance! I like that! Thanks for the suggestion! oh my gosh - toooo cute. Visiting from the blog hop. Now following your cute blog. Would love for you to stop by and say hi! Thanks for the invite! I will be sure to check it out! So pretty --I am following you on the new Linky Tools. I came over from the Linky Follower party. I would love to have you follow me back. So Beautiful Lindsey, you are so talented! 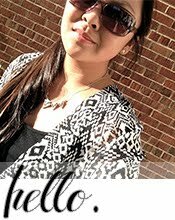 Im your newest follower on your blog now !! I hope you come join me also. Thanks Diane! I will take a look at your blog later! This necklace is gorgeous! Visiting from Serendipity and Spice Manic Monday. I love this necklace. It is so dang pretty!